William Wesley "Billy" Mudd Jr. Celebrating the life of William Wesley "Billy" Mudd Jr.
Be the first to share your favorite memory, photo or story of William Wesley. This memorial page is dedicated for family, friends and future generations to celebrate the life of their loved one. 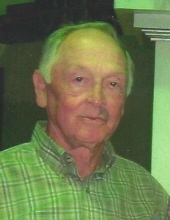 Obituary for William Wesley "Billy" Mudd Jr.
A Bloomfield resident, Mr. William Wesley “Billy” Mudd Jr., age 88, passed away Tuesday, October 16, 2018 at Landmark of Bardstown. He was born October 5, 1930 in Nelson County to the late William Wesley and Lillian Morris Mudd Sr. Billy was the former owner of the Chevron Station in Bloomfield, was an Auctioneer, and the owner of Billy Mudd Real Estate and Billy Mudd Water Service. He was a Kentucky Colonel, the former fire chief for the Bloomfield Fire Department, and was a 65 year member of the Bloomfield Masonic Lodge #57 F&AM where he was a former secretary. Along with his parents, he was preceded in death by his wife, Josephine Haydon Mudd. He is survived by 3 sons, Ronnie Mudd of Bloomfield, Rickey Mudd of Portageville, MO., Tim (Tracey) Cheek of Bloomfield, his step-son, David Allen (Roberta) Young, 7 grandchildren, 12 great grandchildren, and his caregiver, Lori Wells of Bloomfield. Funeral services for Mr. William Wesley “Billy” Mudd Jr. will be 11:00 am Saturday, October 20, 2018 at the Houghlin Funeral Home in Bloomfield. Bro. Tom Sparrow will officiate. Interment will be in Maple Grove Cemetery. Visitation will be Friday from 4:00-8:00 pm. A Masonic memorial service will be at 5:30 pm Friday. The Houghlin Funeral Home of Bloomfield is in charge of arrangements. To send flowers or a remembrance gift to the family of William Wesley "Billy" Mudd Jr., please visit our Tribute Store. A Masonic memorial service will be at 5:30 pm. "Email Address" would like to share the life celebration of William Wesley "Billy" Mudd Jr.. Click on the "link" to go to share a favorite memory or leave a condolence message for the family.